In this paper, we propose a method by which an agent can autonomously construct a state-representation to achieve state-identification with a sufficient Markovian property. Furthermore, the agent does this using continuous and multi-dimensional observationspace in partially observable environments. 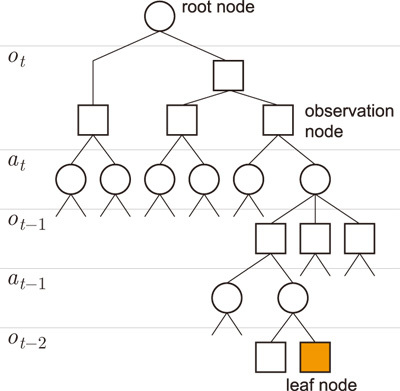 In order to deal with the non-Markovian property of the environment, a state-representation of a decision tree structure based on past observations and actions is used. This representation is gradually segmented to achieve appropriate state-distinction. Because the observation-space of the agent is not segmented in advance, the agent has to determine the cause of its state-representation insufficiency: (1) insufficient observation-space segmentation, or (2) perceptual aliasing. In the proposed method, the cause is determined using a statistical analysis of past experiences, and the method of state-segmentation is decided based on this cause. Results of simulations in two-dimensional grid-environments and experiments with real mobile robot navigating in two-dimensional continuous workspace show that an agent can successfully acquire navigation behaviors with many hidden states. K. Inoue, T. Arai, and J. Ota, “Behavior Acquisition in Partially Observable Environments by Autonomous Segmentation of the Observation Space,” J. Robot. Mechatron., Vol.27, No.3, pp. 293-304, 2015. R. Pfeifer and C. Scheier, “Understanding Intelligence,” MIT Press, 1999. H. Kawano, “Three-Dimensional Obstacle Avoidance of Blimp-Type Unmanned Aerial Vehicle Flying in Unknown and Non-Uniform Wind Disturbance,” J. of Robotics and Mechatronics, Vol.19, No.2, pp. 166-173, 2007. L. Chrisman, “Reinforcement Learning with Perceptual Aliasing: The Perceptual Distinctions Approach,” Proc. 10th Int. Conf. on Artificial Intelligence, pp. 183-188, 1992. L. P. Kaelbling, M. L. Littman, and A. R. Cassandra, “Planning and Acting in Partially Observable Stochastic Domains,” Artificial Intelligence, Vol.101, pp. 99-134, 1998. S. Singh, T. Jaakkola, and M. Jordan, “Learning Without State-Estimation in Partially Observable Markovian Decision Processes,” Proc. 11th Int. Conf. on Machine Learning, pp. 284-292, 1994. M. Littman, “Memoryless policies: Theoretical limitations and practical results,” Proc. Int. Conf. on Simulation of Adaptive Behavior: From Animals to Animats 3, MIT Press, pp. 297-305, 1994. L.-J. Lin and T. M. Mitchell, “Reinforcement learning with hidden states,” Proc. 2nd Int. Conf. on Simulation of Adaptive Behavior: From Animals to Animats, pp. 271-280, 1993. S. D. Whitehead and L. J. Lin, “Reinforcement learning of non-Markov decision processes,” Artificial Intelligence, Vol.73, No.1-2, pp. 271-306, 1995. M. Wiering and J. Schmidhuber, “HQ-Learning,” Adaptive Behavior, Vol.6, No.2, pp. 219-246, 1998. R. Sun and C. Sessions, “Self-segmentation of sequences: automatic formation of hierarchies of sequential behaviors,” IEEE Trans. Systems, Man, and Cybernetics, Vol.B-30-3, pp. 403-418, 2000. H. Lee, H. Kayama, and K. Abe, “Labeling Q-Learning in POMDP Environments,” IEICE Trans. Information and Systems, Vol.E85-D. No.9, pp. 1425-1432, 2002. L. Lin and T. M. Mitchell, “Memory approaches to reinforcement learning in non- Markovian domains,” Technical Report CMU-CS-92-138, Carnegie Mellon University, 1992. S. Thrun, “Monte Carlo POMDPs,” Neural Information Processing Systems, Vol.12, MIT Press, pp. 1064-1070, 2000. R. A. McCallum, “Instance-Based Utile Distinction for Reinforcement Learning with Hidden State,” Proc. 12th Int. Conf. on Machine Learning, pp. 387-395, 1995. N. Suematsu and A. Hayashi, “A Reinforcement Learning Algorithm in Partially Observable Environments Using Short-Term Memory,” Neural Information Processing Systems, Vol.11, MIT Press, pp. 1059-1065, 1999. A. K. McCallum, “Learning to use selective attention and short-term memory in sequential tasks,” From Animals to Animats 4: Proc. of 4th Int. Conf. on Simulation of Adaptive Behavior, The MIT Press, pp. 315-324, 1996. H. Murao and S. Kitamura, “QLASS: an enhancement of Q-learning to generate state space adaptively,” Proc. European Conf. on Artificial Life, 1997. K. Yamada, K. Ohkura, M. M. Svinin, and K. Ueda, “Adaptive Segmentation of the State Space based on Bayesian Discrimination in Reinforcement Learning,” Proc. 6th Int. Symp. on Artificial Life and Robotics, pp. 168-171, 2001. T. Nakamura and T. Ogasawara, “Self-Partitioning State Space for Behavior Acquisition of Vision-Based Mobile Robots,” J. of Robotics and Mechatronics, Vol.13, No.6, pp. 625-636, 2001. C. J. C. H. Watkins and P. Dayan, “Technical Note: Q-Learning,” Machine Learning, Vol.8, pp. 279-292, 1992. P. Maes, “Behavior-Based Artificial Intelligence,” Proc. of the 2nd Conf. on Simulated and Adaptive Behavior, MIT Press, pp. 2-10, 1993.